A gigantic steer that some consider the largest in Australia has become a viral sensation. 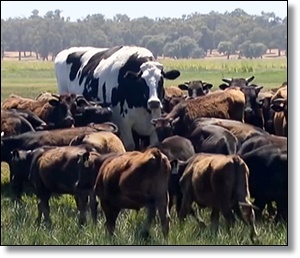 The cow is named “Knickers” and stands at 76 inches at the shoulder, towering over other cows, its owner said, adding that the cow almost as tall as Michael Jordan. It weighs about 3,086 pounds and lives on a farm in Myalup, located 85 miles south of Perth, Australia. Knickers is a Holstein-Friesian, a dairy breed known for being quite tall, according to an industry website about the animals. “Holsteins are most quickly recognized by their distinctive color markings and outstanding milk production. Holsteins are large cattle with color patterns of black and white or red and white,” it says. On average, Holsteins weigh about 1,500 pounds and are 58 inches tall at the shoulder. Geoff Pearson, the owner, said he tried to auction Knickers in October, but meat processors said they couldn’t handle the size. “Knickers lives on,” Pearson told the BBC.